I started teaching fresh out of college. I was enthusiastic, passionate, and ready to put myself on the line in the fight against educational inequity. But I think I was a bit naïve. I thought I would be able to go into my classroom and somehow reach every student I taught. And while I feel sure, during my short stint of teaching, that I was able to make a difference in the lives of hundreds of students, there’s one student in particular that until this day, I know I failed. My student had a number of developmental challenges, including autism, which prevented him from speaking. He would come into my classroom every day, sit quietly, and stare at the wall. When I tried to help, working with him one on one, he would often look at me with a blank stare. And in a class with 41 other students, many of which also had learning disabilities, there was no way that I could address his unique academic needs. My experience taught me what so many other teachers across this country already know. There are two important things that teachers need to have longevity in the classroom: 1. A growth mindset, the belief that all students can succeed; and 2. Ongoing training and support to ensure that they are meeting the needs of all students. 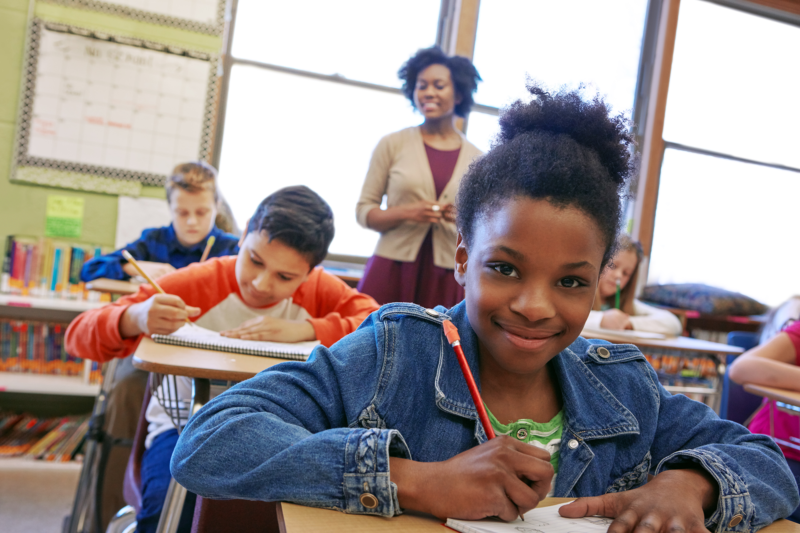 “What all good teachers have in common, however, is that they set high standards for their students and do not settle for anything less.” –Marva Collins. Marva Collins, a trailblazer for education reform for black students, began her career in Chicago, IL as a substitute teacher. Fed up with a system that gave black students “mediocre access to the resources that were readily available to white students,” she began the Westside Preparatory School, with just $5,000. She made it clear that her doors were open to students “who’d been failed by the bigger school systems, especially those who’d been diagnosed with impossible-to-overcome learning disabilities.” Despite these students being labeled “learning disabled” or “uneducable”, Collins had a tremendous amount success with these students, who later went on to become doctors, lawyers, and other professionals. 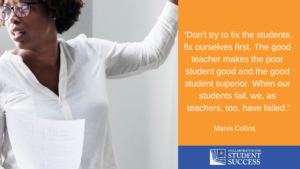 She touched the lives of thousands of students, and later in her career became a trusted resource for teacher development. I tell Mrs. Collin’s story because there are important lessons to be learned. First, she never gave up on her students. In an Ebony Magazine interview, she noted that “If Abraham Lincoln were enrolled in public schools today, he would probably be in a learning disability program. Lincoln didn’t learn to read until age 14. No one should rule any child out of the educational picture.” She truly believed that all students were cable of learning and could be successful, something that all teachers should aspire to. Secondly, as an honored educator, Collins shared her wealth of knowledge, her methods, with both beginning and veteran teachers. In 1985, she began the Westside Preparatory Teacher Training Institute, which “enabled her to teach her methods to thousands of educators, who would go on to use them in schools throughout America.” She knew the importance of providing other educators with the training they needed in order to meet the need of each student. Looking back on it, I still feel that I failed my student for two reasons: 1. I had the mindset that I couldn’t help him, so my belief became my reality; and 2. I hadn’t had the proper training to even know where to begin. If only I had her words to guide to me, and had had the proper supports, who knows how successful my student, and other students like him, could have been. So, the next time you have an inkling of doubt, I hope my story and the legacy of Marva Collins inspires you to persevere.